Yangon (Agenzia Fides) - The new president of Myanmar, Win Myint, has granted amnesty to over 8,500 prisoners, including several political prisoners, in conjunction with the traditional New Year of Myanmar, the Thingyan, the Burmese New Year was celebrated with the Water Festival, from 13 to 16 April. Amnesty was granted to 8,490 citizens of Myanmar and 51 foreigners who were released yesterday, 17 April. Among the released there are two Protestant Christian Pastors from the Kachin minority, who were in a prison in Lashio, in northern Myanmar. Last year, Pastor Dumdaw Nawng Lat, 65, was sentenced to four years and three months in prison and Baptist youth leader Langjaw Gam Seng, 35, was sentenced to two years and three months for allegedly providing support to an ethnic armed group and defaming the military. According to information gathered by Agenzia Fides, in the aftermath of a government offensive in northern Myanmar, the two had helped journalists report on a Catholic church that was destroyed in an airstrike in November 2016 (see Fides 19/1/2017). The amnesty regards prisoners already convicted in court for different types of crimes. 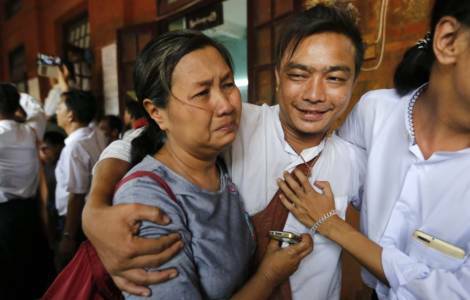 Two "Reuters" reporters, Wa Lone and Kyaw Soe Oo, facing a high-profile freedom of the press trial for possessing secret official documents remain in jail.